SAN JOSE, Calif., Nov. 15, 2018 /PRNewswire/ -- Quantum Corp. (NYSE: QTM) today announced a new ruggedized, in-vehicle storage solution designed specifically for mobile and remote capture of video and other IoT sensor data. Quantum Mobile Storage products are available in different capacity and performance models and are designed for mobile environment such as autonomous vehicle development, where each vehicle produces several terabytes of video, image and sensor data every day. It simplifies data ingest by including unique features that automate the process of offloading data to a StorNext shared storage environment. The new offering, combined with Quantum's StorNext high performance parallel file system, enables a complete workflow for autonomous vehicle development. Quantum Mobile Storage also has applications for other mobile storage environments such as rolling stock video on trains and buses, as well as military uses. Small Form Factor Chassis Design: Minimizes storage space, enabling more room for ECUs, compute or other hardware components. Magazine Carrier: Optional ruggedized case provides protection and security for drive magazines during storage and transport. 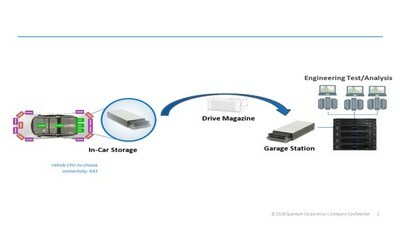 Quantum Mobile Storage incorporates a unique removable magazine design that enables the fastest transport of data from the vehicle to the garage or datacenter. The removable magazine also allows for long duration test drives where full magazines can be swapped with empty ones so the test drive can continue collecting data without visiting the garage. Designed for Automotive Use: Ruggedized unit operates in a broad range of environmental conditions necessary for proper vehicle testing; 12VDC power ensures easy integration, efficient power use and reliable operation. RAID Support: Ensures high performance and reliability, including RAID 5 or RAID 6 for added protection. Automated Ingest: Quantum leverages StorNext® FlexSync™ to simplify the data ingest process. Autonomous vehicle testing generates and captures massive amounts of data each day which must be analysed in exceptionally short timeframes, and then preserved for long-term reference. Quantum Mobile Storage offers a uniquely comprehensive infrastructure for capturing, storing, managing, protecting and accessing petabytes to exabytes of test and development data. Quantum Mobile Storage integrates with Quantum's StorNext based scale-out storage portfolio, which is uniquely suited to address the challenges of sharing, protecting, preserving and analysing massive volumes of rich media. Because StorNext environments offer shared data access in a unified global namespace across multiple tiers of workflow-optimized storage, autonomous vehicle developers can substantially gain efficiency, shortening their test and development cycles. With its industry-leading automated StorNext ingest capability, Quantum Mobile Storage can greatly improve overall productivity by enhancing efficiency at the beginning of the workflow. Quantum Mobile Storage is designed to be adapted for use in a wide range of applications beyond vehicle testing, such as mobile security and compliance platforms, video surveillance, public transportation, shipping, law enforcement, on-set video recording and production. The Quantum storage solution provides flexibility to align storage capacity, performance and cost with data capture requirements by choosing SSDs or HDDs in 2.5" or 3.5" form factors. Quantum Mobile Storage will be generally available in early 2019, and is available to quote today. "With the dynamic environmental conditions, limited space and power available in a moving vehicle, data storage has been a persistent hurdle for autonomous vehicle research. Quantum Mobile Storage addresses this storage challenge. This is vital to our mission to bring safe and reliable AVs to the world's roadways." "Autonomous driving has the potential to change society in profound ways, and its development depends on an enormous volume of rich media. Quantum Mobile Storage products fill an important gap by providing an efficient method for getting this data from the vehicle to the analysis and development environment. This solution has been engineered to operate under the rigors of mobile environments, and therefore opens the door to a variety of other emerging applications." Quantum, the Quantum logo, StorNext and FlexSync are either registered trademarks or trademarks of Quantum Corporation and its affiliates in the United States and/or other countries. All other trademarks are the property of their respective owners. "Safe Harbor" Statement: This press release contains "forward-looking" statements. All statements other than statements of historical fact are statements that could be deemed forward-looking statements. Quantum advises caution in reliance on forward-looking statements. Forward-looking statements include, without limitation, that autonomous driving has the potential to change society in profound ways and the the features, benefits, timing of release and value to customers from the Quantum Mobile Storage offering. All forward-looking statements are based on information available to Quantum on the date hereof. These statements involve known and unknown risks, uncertainties and other factors that may cause Quantum's actual results to differ materially from those implied by the forward-looking statement, including unexpected changes in the Company's business. More detailed information about these risk factors, and additional risk factors, are set forth in Quantum's periodic filings with the Securities and Exchange Commission, including, but not limited to, those risks and uncertainties listed in the section entitled "Risk Factors," in Quantum's Quarterly Report on Form 10-Q filed with the Securities and Exchange Commission on November 9, 2017, especially those risks listed in this section under the headings "Our results of operations depend on a limited number of products and on new product introductions, which may not be successful, in which case our business, financial condition and results of operations may be materially and adversely affected." Quantum expressly disclaims any obligation to update or alter its forward-looking statements, whether as a result of new information, future events or otherwise, except as required by applicable law.